Around the Arbor Teas office, early spring signifies a very special time: Girl Scout cookie season! We’re lucky to have many staff members who have Girl Scouts in their family, so for a few blissful months our office is chock full of cookies! And since we’re never without a cup of tea, cookies are often consumed with an array of teas. After a few arduous weeks of tasting cookies with various teas, we came up with this playful guide that pairs the two together. Follow along with our suggestions for fun pairings with some of our favorite sweet treats! Caramel and chocolate pair perfectly with sweet nutty vanilla flavors. Shortbread and Earl Grey make a classic combination. Creamy chocolate and rich Chaga Chicory are a decadent duo. Peanut butter and malty black tea make an easy and delicious pair. Minty chocolate and bold green tea reminds us of our Organic Moroccan Mint! 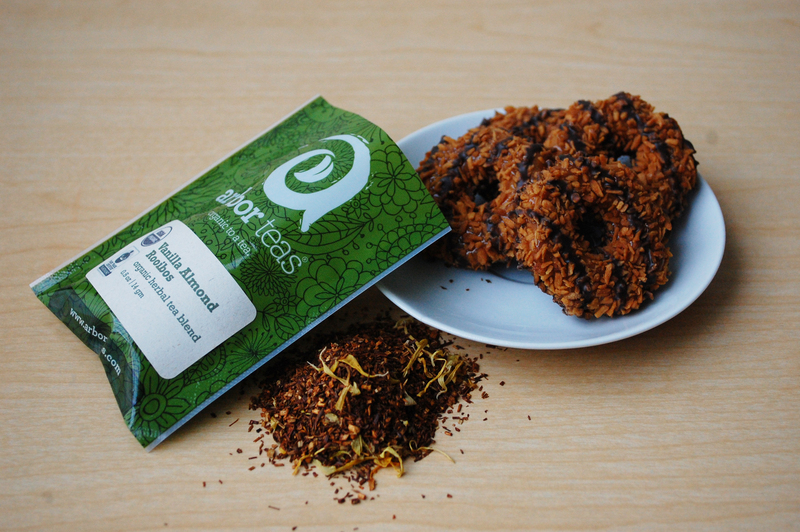 Bright lemony Darjeeling tea is a great compliment to the citrusy flavor of the cookies. Super sweet toffee pairs well alongside earthy mellow pu erh. What’s a s’more without a little campfire scent? Have another suggestion or maybe you have some Girl Scout cookies we don’t? Share it with us on Facebook, Twitter or Instagram! We love hearing your ideas.